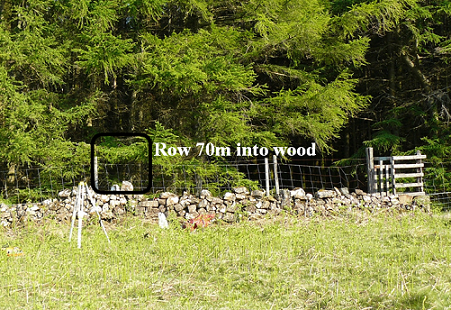 The remains of a five stone row about 18m long; two standing, 2.5m and 2.4m of square section. 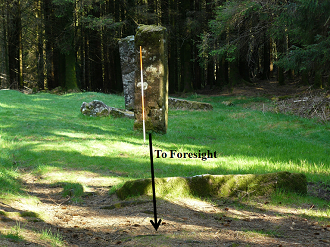 The three fallen stones are each about 2.3m long. 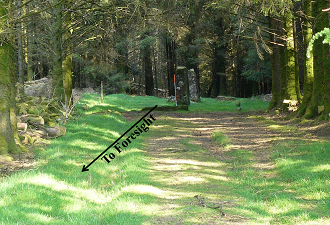 The alignment is in a clearing about 70m into a wood. The theodolite is on the line of the indicated direction. An alignment for the rising southern major standstill moon was found. Parallax correction for the forward measurement position applied. The alignment is for the 'wobble' to the north. i.e. –28º 38′.5 June. (There is no alignment to the right for any of the other three key lunar declinations). Note 1. As viewed from the OP there would not be the necessary warning of the moon's appearance. Viewing from the left would effectively lower the horizon. An observer positioned 20m to the left would see the upper limb of the moon as shown. Further left would increase the effect. Note 2. This alignment would be expected to be for the moon in December when the sky would be dark, but that would be the time of the New Moon and so not observable. It would be full at midsummer 6 months before/after. The sun would be setting in the NW as the moon was rising. Although the sky would not yet be dark, the moon would be observable. 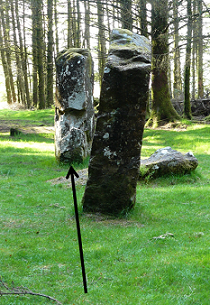 This alignment is marked by a particularly large structure. Perhaps for the reasons given it was felt necessary to emphasise the alignment.